An excursion to a particular branch of a bank located here in Northern VA is best saved for special occasions. Like holidays. Such a stop always delivers the soul-enlightening experience of the weird. Yesterday, I motored to the financial establishment, and waited on line with the myriad of other folks prepared to conduct financial transactions. Soon the mass of humanity parted enough for me to catch a glimpse of the lobby table available for folks to lean on while they ready their paperwork. There stood a man, and on the table next to him sat a monkey. Yes, a real-live monkey. The man was dressed in khakis. 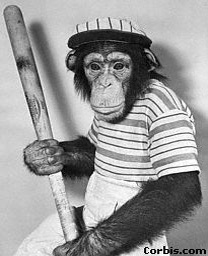 The monkey wore a little New York Mets uniform. He was not as big as a chimp, and there was a hole in his Met's pants so his curly tail could fit through. And he sat there quietly, surveying the crowd, his coconut-shaped head sporting wiry hair. The bank manager was on the lookout, but so consumed with demanding customers that he didn't have the time to say to the monkey's uncle, "Get that ape outta my branch." "What's a monkey doing in a bank?" "And why is he wearing a Mets uniform?" "Must be a fan," I replied. There was another wild animal in the environs. Her name was Rachel. Human, and about three years old, she was queen of her own reign of terror. Running around screaming, entering offices where bank personnel were conducting loan business, taking a stapler off a desk and throwing it on the floor of the bank lobby. Rachel's father seemed unconcerned. "Rachel, don't do that," he said quietly, then turned back to the teller and his business. The little minky watched Rachel. She scared him. He put his little monkey hand on his owner's arm for security as the man continued to fill out his deposit slips. When Rachel pulled down the steel stand that holds the sign, "Please Wait Here for the Next Available Teller," justice prevailed. "Sir, please take that child out of here," the bank manager demanded. You know I fell out laughing! Thanks for the good laugh. It made my day (again! ).